Feelings: Happy Birthday CK! RB's family threw CK his first birthday bash out on Long Island. They took care of all details from food to balloons, but we decided to bring a vegan birthday cake that CK can enjoy. He has not shown any signs of lactose issues that have haunted both RB and I our entire lives, but I just wanted to make sure he would not purge his first birthday cake. Upon searching for a vegan cake, our vegan baked goods connoisseur PeeWee recommended a new bakery, Champs Family Bakery in Williamsburg, which serves all vegan pastries and cakes. I found it funny that their Yelp page lists the ambiance as "Hipster." Who knew the term Hipster has become an adjective, and what vegan bakery in Williamsburg is not, by default, hipster. 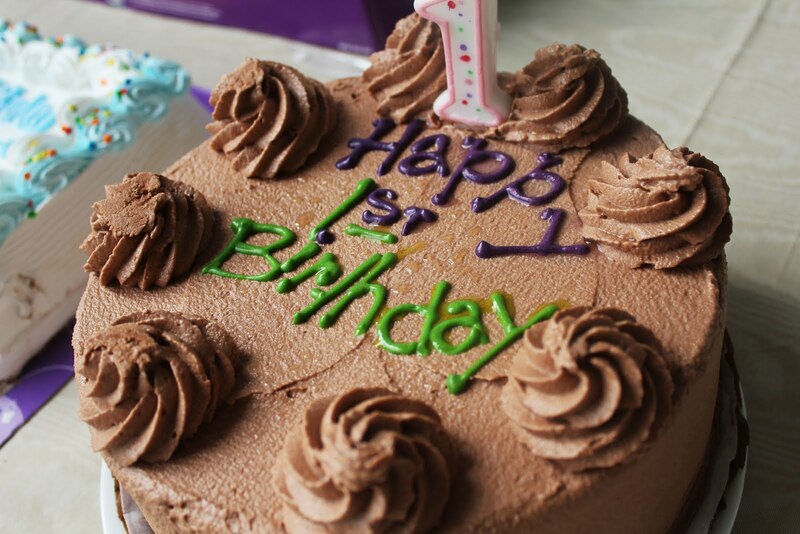 We ordered a nine inch strawberry cake with chocolate frosting and "Happy 1st Birthday!" written on top. This was easily the heaviest cake I have ever carried in my life. The sponge was extremely dense and moist while the chocolate 'butter' cream frosting was light and sweet. It was a bit sweeter than I would like and tasted more like a pastry than a cake. But more importantly, I was incredibly impressed by their adorable writing and delightful presence of the cake. The cake brought a hint of Brooklyn and creative flair to the Long Island birthday party, and everyone was impressed and curious. Did CK enjoy the cake? It turns out he too, just like us, does not have much of a sweet tooth. I'm not surprised your genetic offspring has a mature palate. Bitter dark chocolate cake for 2nd birthday! Haha. He'll def be a beer drinker when he's older...just like his papa! Awww, runs in the family. Hopefully he'll have a high tolerance for spicy foods. Happy Birthday! Maybe a sweet tooth is hereditary because my parents don't have one and I don't have one neither.